About Us: Vos iz der Taytsh? For centuries in the khadorim, or traditional Jewish schools of Eastern Europe, Jews engaged in the practice of taytsh, rendering lofty liturgical texts in loshn-koydesh into the heymish Yiddish vernacular. In the 19th century, intellectuals reinvented this custom, bringing the classics of world literature into Yiddish, and sparking the imagination of the Jewish masses. Now in the 21st century, the Yiddish Book Center brings you Taytsh.org, to help translate the treasures of Yiddish literature into English for a new generation of readers. Post your works-in-progress and invite commentary and annotation from your colleagues around the world in our registered users's Workshop. Recommend your favorite Yiddish literary works to be translated on the Suggested Translations pages. 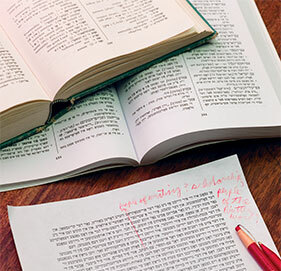 Discuss the world of Yiddish literature, and share news and opportunities in our forums. Access a multitude of resources and links in Tools. With a literature so rich, a culture so complex, and so many works yet untranslated, translators of Yiddish deserve a space devoted to creativity and collaboration. On this site, translators like you have the opportunity to exchange ideas, pool resources, discuss problems, and build community. Register now! Taytsh is made possible through the generous support of the Righteous Persons Foundation with additional support from the Gold Family Foundation.